In Chapter 9 of Butchery on Bond Street, I’ve offered glimpses, both from real life as well as from a contemporary novella, into the gambling underworld that formed a vital part of the downtown demi-monde which Harvey Burdell inhabited. Burdell’s game was faro, but he acted as dealer, eliminating any financial risk for himself while enjoying the spotlight and control that he relished in every part of his life. Though the scene below shows a faro table ten years after Burdell’s grisly demise, the picture changed very little in that decade. 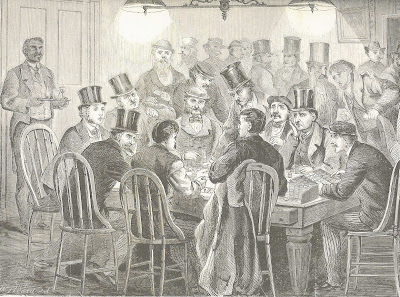 Thomas Francis Beard’s engraving published in the February 23, 1867 issue of Harper’s Weekly shows the crowd gathered around the dealer in the front center, at the moment of the “turn,” when the outcome of the betting is determined. At the right-hand end of the table sits the case-keeper, who keeps track of the cards dealt for the players who try to calculate their chances as the game proceeds. The elegant dress of many of the players depicts a typical evening for Dr. Burdell, unwinding after a long day in his dental operatory ministering to the needs of a mixed clientele. This recreation may well have caused the end of Burdell’s life, though. Skillful at his game, Dr. Burdell allegedly won $6000 one evening late in January of 1857, and the unhappy loser may well have taken vengeance on the unlucky dentist, perhaps acting in Emma Cunningham’s employ.